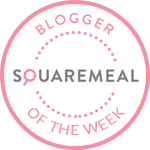 Emily's Recipes and Reviews | UK Food Blog | Leicestershire : sausage, spinach, mozzarella and egg pan bake with debbie∧rew's. ♥ Black pepper and torn fresh basil to serve. Equipment; Small saucepan, spatula, frying pan with heatproof handle. 1. Melt the butter in a saucepan, add the flour to make a roux and cook off for 3 minutes. 2. Gradually pour in the milk, stirring to create a béchamel. Cook for 5 minutes, stirring. 3. Add the cheese and allow to melt, season, take off the heat and cover with greaseproof paper so a skin doesn’t form. Step two. Have all your sausage, spinach, mozzarella and red peppers at the ready. I grilled my sausages on a medium heat for around 15-20 minutes and wilted my spinach with a little water for 2-3 minutes. Step three. Turn on your grill to a medium heat. Step four. Add a little oil to your pan and turn onto a medium heat. Break the eggs in the pan. Step five. As soon as the eggs turn white, scatter your sausages, peppers and spinach around the pan. Pour the cheese sauce on top. Step six. Sprinkle with the mozzarella and put under the grill. It's ready when the top is golden and bubbling, which for me took just under 10 minutes. Maybe put the kettle on and get that tea ready while you wait? How will you be celebrating Mother's Day? What are your favourite breakfast recipes? I'll also be posting an Earl Grey inspired cocktail recipe this week so watch out for that! Post in collaboration with debbie&andrew's sausages. 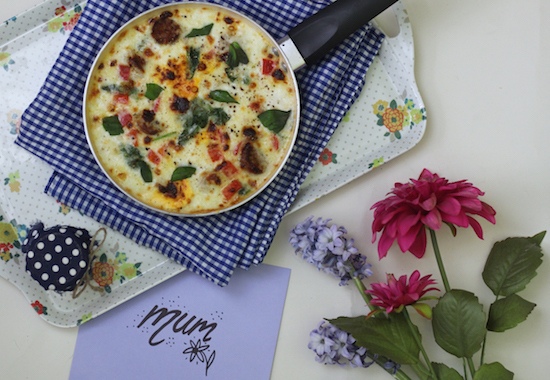 This is a lovely idea for a delicious, but super simply breakfast or brunch - perfect for any Mum! I'm a dreadful daughter. I didn't even know when Mother's Day was until I read this. Better get my thinking cap on fast. Your breakfast dish looks totally delicious and is so easily adapted to vegetarians - hooray for vegetarian sausages! Yum this looks amazing - would love to try this!